They were four lads from a tough industrial British city. They formed a band, and went to Hamburg in Germany to The Star Club on the Reeperbahn for a residency. Up to seven sets a day. They lived together in a room above the stage. Starting at noon and finishing at 2am. Gruelling stuff. John, Terry, Bill and Tony. Hang on a minute. No Paul or George? Doesn’t one of them criticise George Martin’s tie at some point? But we are getting ahead of ourselves. Let’s start with Ozzy. Ozzy’s jobs were so awful, his best job was working in an abattoir. He only left after attacking a co-worker with a pole after his colleague cut his apron strings for a prank. A 20 year old Ozzy put an ad in Ringway Music shop window in Birmingham’s Bull Ring. “Ozzy Zig Needs Gig” it said, for no real reason. Soon afterwards there was a knock on Ozzy’s door. Geezer Butler was a trainee accountant but sported fashionable bell bottomed velvet trousers and a luxurious moustache, all which would have given away to Sherlock Holmes that in his spare time he was a part time musician, if the callouses on his left hand and whiff of “herbal” cigarettes didn’t already point that way. His band were named Rare Breed, and they had just lost their singer. After a brief discussion Ozzy was in the band. Unfortunately Rare Breed were terrible, and Ozzy left three songs into his first gig, when the manager of the working men’s club in Walsall they were playing asked them to stop. Geezer quit the following day. Geezer did know everyone in the Birmingham music scene however, including Robert Plant, whom he bumped into one day when walking around town with Ozzy. Plant had a difficult decision to make: whether to join the Yardbirds with Jimmy Page, or a local band called Hobbstweedle. Tricky decision. I think it worked out okay for him. Although Rare Breed petered out, Ozzy soon had another moustachioed knock on his door in answer to his advert in Ringway Music. It was Tony Iommi and Bill Ward, whose band “Mythology” had just broken up after a police bust for marijuana possession had left them with a bad reputation and no gigs. Iommi recognised Ozzy from school, where he had regularly hit the younger boy to keep him in his place. He greeted Ozzy with warmth. Actually he didn’t. What he actually said was “Aw, f–ing hell! It’s you!” upon recognising Ozzy. 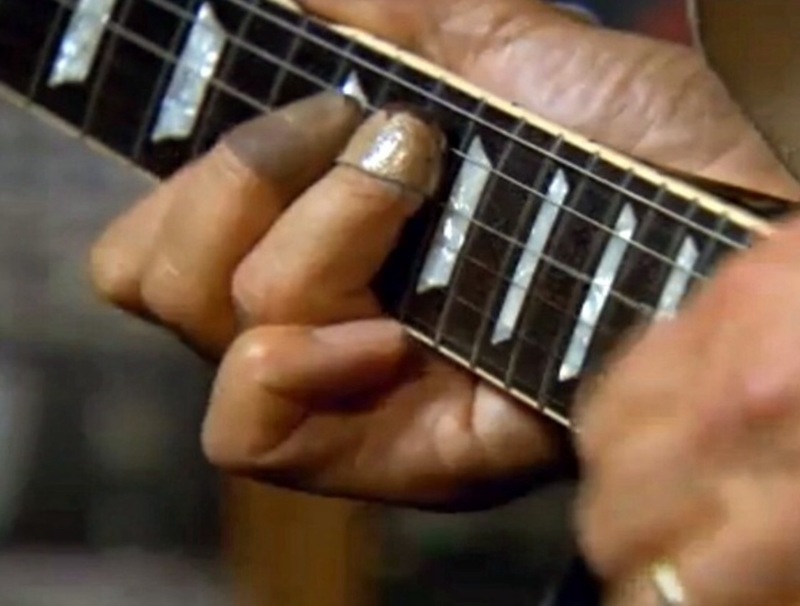 Tony Iommi had been a sheet metal worker but the machine had come down on his right hand and severed the tips of the middle and ring fingers. There’s never a good hand to lose a finger or two from, but as a left handed guitar player, the right hand is definitely the worst option. What’s more, the accident occurred on the day he was due to quit the job to take up music as a full time profession. His guitar playing days were effectively over before they had begun. A friend bought a profoundly depressed Iommi an album by Django Reinhardt. Django played gypsy jazz and used just two fingers to fret chords after burning his hand in a fire, and played the most intricate melodies. He was an extraordinary player. Back on Ozzy’s doorstep, against his better judgement, and perhaps only because Ozzy now had a PA system and microphone, Iommi welcomed Ozzy into the fold. Geezer soon joined after agreeing to switch from rhythm guitar to bass. After briefly flirting with Polka Tulk Blues Band – named after a brand of talcum powder used by Ozzy’s mum – they settled on “Earth” as the band name. They tried to get gigs using the novel, and frankly ridiculous strategy of turning up with all their stuff in a van outside venues wherever a big band was coming into town just in case they didn’t show. And once, in 1968, this insane, lunatic strategy for stardom actually worked. The Tull were a no-show and were uncontactable when due to go on, so Ozzy and co got shoved onstage in their place, to keep the crowd happy. Eventually Ian Anderson did show up – his van broke down on the M6 – and whilst Earth were whipping up a storm onstage, Ozzy saw Anderson nodding his head in approval. On the back of that gig, they found a manager who at the end of 1968 booked them a tour with Ten Years After. But just as they were all set, Iommi quit the band. To join Jethro Tull. That’s the soon-to-be heaviest most demonic guitarist in the world playing with what we might uncharitably describe as Rock’s greatest flute playing flamingo impressionist. You can see Iommi on The Rolling Stones’ Rock n Roll Circus, wearing a white cowboy hat, alongside Jagger and Lennon and the rest of them. He lasted just four days. But what a great four days to be in Jethro Tull. After the incredible high of playing with rock royalty Iommi decided he didn’t like being a side man to a flamboyant, slightly potty show-off of a front man. Hmm. Not sure he thought that through. Back in Aston Iommi noticed queues going around the corner of the nearby Orient cinema for a horror film near where they were rehearsing. “Isn’t it strange how people will pay money to frighten themselves?” said Iommi. “Maybe we should stop doing the blues and write scary music instead”. Off went Bill and Ozzy to write “Black Sabbath”, based upon a vision Geezer reckons he saw one night at the end of his bed of a “figure in black which points at me”. It was probably Ozzy getting up to go to the toilet. Geezer nicked the title from a Boris Karloff film, Three Faces of Fear. It turned out there was another local covers band called Earth, so a name change was proposed to go with the new song. Their manager, Jim Simpson, was not convinced. “I don’t think you’ll get anywhere with that, lads” he said. Ozzy remembers the first time they played the song because all the girls in the venue ran out screaming, much to his chagrin. “Isn’t the whole point of being in a band to get a shag?” complained Ozzy. “They’ll get used to it” reckoned Geezer, who remembered the audience stopping dead in a trance until the end of the song, and then erupting and going nuts as it finished. With the new name, Black Sabbath went back to the Star Club for another residency. When Ozzy once went through the numbers, he reckoned Black Sabbath ended up playing more shows in Hamburg than The Beatles. The recording of the debut album was at Regent Sound Studios in Denmark St. The same studio that The Rolling Stones recorded their debut album. Their budget was £500. Vertigo, a new swirly-labelled part of the Philips group, said yes. Their advance was princely. £105 to each band member and Ozzy knew exactly how to celebrate. He bought himself a bottle of Brut aftershave. 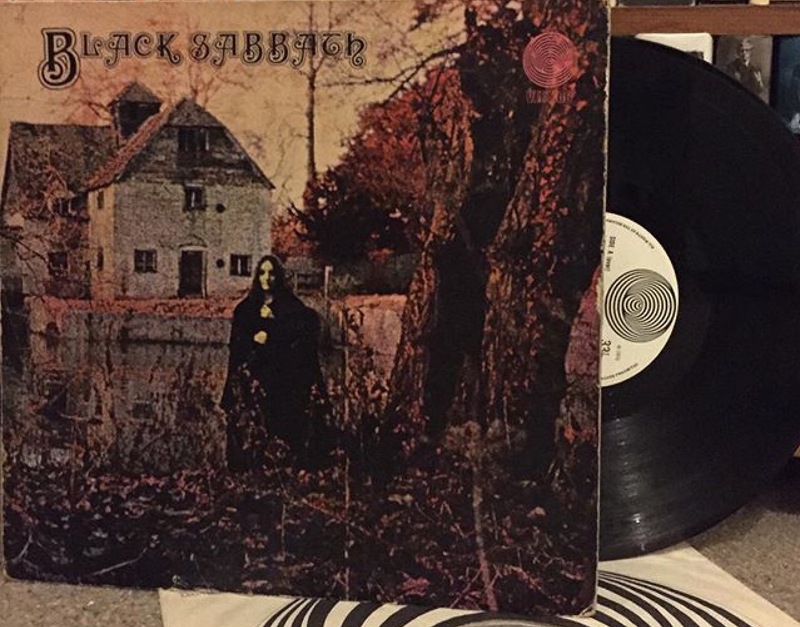 Black Sabbath was released on Friday 13th February 1970. The critics hated it, but it reached number eight in the UK charts and number 23 in the USA. But as unexpectedly successful as it was, the album isn’t a success because of how many it sold. It’s a success because of what followed and the influence it eventually had. Judas Priest, Metallica, Iron Maiden, Nirvana, Slayer, Mastodon and countless others all owe their careers to this album. An entire genre of music invented by a guitarist without a full set of fingers, a jazz drummer, a former abattoir worker and, best of all, a trainee accountant. And the most amazing part of this story? They recorded the whole album in just eight hours in a tiny studio at the back of what is now a guitar shop in Soho. It took them eight hours to invent heavy metal. Well, eight hours, plus the two years before it, hustling for gigs, working in rubbish jobs in a tough industrial city. After a run through of their live set and a couple of hours double tracking vocals and guitar lines it was done. “We were in the pub in time for last orders” said Ozzy…. * Other accounts say it was named after a Pakistani-owned shop in Handsworth. If anyone can find a tin of Polka Tulk talc, then let me know – Google is silent on evidence for either theory. Do Helloween Get The Credit They Deserve?